Are We Bear Yet is located in the Alpine Mountain Village Resort which has 75 custom top quality log homes, is a luxurious resort in Heart of Pigeon Forge, tucked away in the natural wooded beauty of the Smoky Mountains. 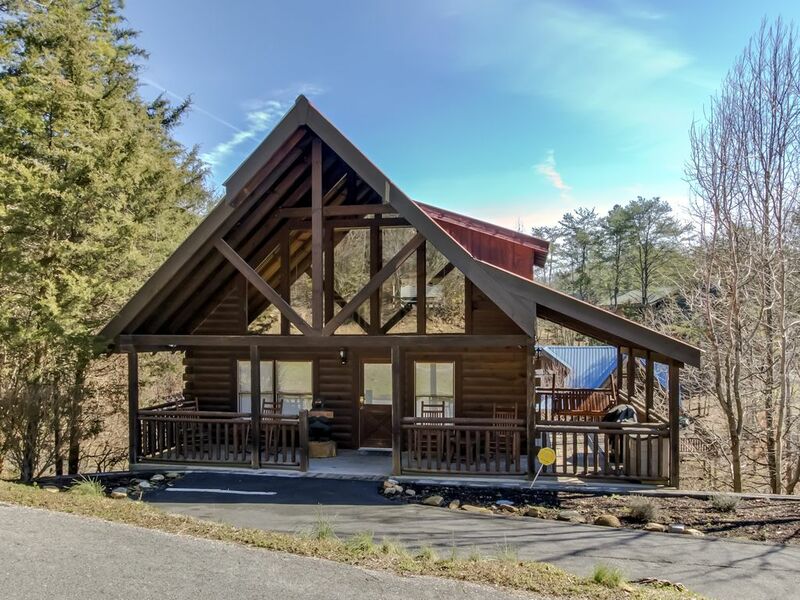 'Are We Bear Yet' is a custom Premiere rated one bedroom, one bath log cabin in this prestigious resort, which is just a few minutes from Gatlinburg. This rustic cabin is perched on a ridge over looking rolling wooded hills of the Smoky Mountains. This is the perfect place to relax and refresh. This resort features a Wedding Chapel, 2 Outdoor Pools, Covered Pavilion Picnic Area, Walking trails, beautiful and a spring fed brook and so much more..... Alpine Mountain Village Resort - is the most convenient resort to the Pigeon Forge Parkway, and was given the honor of editor's choice for family resorts by Southern Living Magazine. Stay in a truly wonderful two story cabin and enjoy an unforgettable honeymoon, romantic getaway or a family vacation. With everything you want in a log cabin, and more, this large cabin is tastefully decorated. Inside the master suite you can relax in a long bubble bath in the Jacuzzi jetted tub or just enjoy watching a favorite show on the high Def Flat screen TV. Just off the Master suite, you will love the back deck. It offers a private hot tub and dining facilities to have your morning coffee and see the sun rise. The living area boasts cathedral ceilings, Custom Queen Sofa Sleeper, High Def Flat Screen TV, DVD, Free wireless Internet, and who wouldn't enjoy the opportunity to sit by a crackling fire in the stone stack fireplace. The large kitchen is tastefully decorated and fully equipped with all appliances. The upstairs features a game room with pool table, pub table, custom Queen Sofa Sleeper, board games, and PS2 with video games for the kids. Outdoors, you can take in the nature and beauty of the Mountains on the front porch. We provide you with both a Gas Grill, Chain Saw Bear Wood Carvings, Porch Swing and Rocking chairs. This cabin offers plenty of Smoky Mountain charm. Don't miss your opportunity to book this peaceful vacation home, and make memories last a life time. ****FREE Wi-Fi WIRELESS AT & T INTERNET SERVICE! Near By Attractions: Only Minutes to Dollywood & Splash Country, Ripley's Aquarium, Live Music Theatres, Outlet Shopping, Gatlinburg, Cades Cove, Horseback Riding, Hiking, Rafting, & The Smoky Mountain National Park. 35 Miles to Cherokee NC Indian Reservation with shopping, restaurants and Harrah's Casino. Large Jacuzzi Bath Tub in the Bedroom. Separate Shower, Toilet & Sink. All Linens are Provided except for the Pack N Play. Please bring Sheets and a blanket for baby if you plan on using it. We provide towels for the bathroom and the Kitchen but we ask that you bring your own Beach Towels for the Swimming Pool. Seats 4. Has gas Fireplace, sofa, Comfy rocking chair, Coffee Table, Large Flat Screen TV & Ceiling Fan. Fully Equipped Kitchen. Even a Crock Pot! Dining Table for 4, 2 Bar Stools at Kitchen Bar. iTV's n Living room and Bedroon both have Comcast cable. Several Video Games for PS2. We do not provide a bike, But bring your Bikes! Guests love to ride in the resort! Front Porch includes Rocking Chairs, Grill and Porch Swing. Front L Shaped Deck with Rocking Chairs and a porch swing, Back deck with Hot Tub and Bistro Table for Morning Coffee. No steps up to the front door. The cabin was very nice and clean. It was close to the parkway and with easy access to the attractions. I would recommend this cabin to anyone! Awesome place will be back for sure!!!!!! Great property with awesome location! Overall, very clean aside from mold on shower curtain & liner. We enjoyed our stay very much. The cabin was spotless and the bed was okay although I wish it were a king. It was furnished with everything you could possibly need. There were plenty of towels and washcloths. However, the shower curtain and liner need a good washing to remove the mold. The hot tub was awesome too! The cabin is very conveniently located off Sugar Hollow Road. Within 1/2 mile, there are many restaurants, Shopping and Attractions. You are very close to everything yet this Beautiful Wooded resort gives you the cozy feel of a peaceful retreat! NO PETS OR ANIMALS OF ANY KIND! NO SMOKING To secure your reservation there is a 50% Reservation Deposit by credit card at the time of renting. Your remaining balance will be due 45 days prior to arrival. If you rent within 45 days of your stay, the total amount will be charged to your credit/debit card at the time of renting. Rates are subject to change until reservation is made and confirmed. Reservation fee and Damage Insurance Waiver are Non-Refundable Easy On-Line Reservations: VRBO and HomeAway rates are estimates and should not be considered accurate until confirmed by the owner.